Once you have verify your mobile numbers through Bio-metric Re-verification process, most probably you will get a confirmation message from your service provider company. In case you didn't get confirmation message or you just want to counter check/ ensure that your SIM ownership has been properly verified, you can check it free of cost simply dialing a code or sending a message and you will get confirmation. Following are simplest ways of all the 05 mobile service provider companies in Pakistan, to check bio-metric re-verification. No charges applies for this service. Dial *6622# from your Zong number. You will immediately receive confirmation message that "Moaziz Sarif, Apni SIM Biometric vrify karwane ka shukria." You can also get free unlimited calls, 5000 SMS and 500MB data under Zong Biometric Promo. Another SMS service 7911 has been launched to check re-verification of Zong SIMs. To check the verified numbers by sending “V” to this short-code 7911. Dial *336*1# from your Ufone number. Service reply will be "Dear customer your number 033389001xx is verified." Send a blank SMS to 7751. You will confirmation message shortly. Customer can send message (CNIC) to short-code 789 through primary verified number and in return he will get status of numbers against his/her CNIC along with verification stats. Format of this process is sent to primary verified number via SMS. 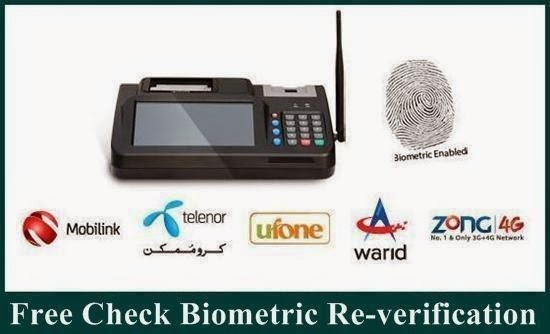 Last date of SIM Verification through Biometric Process is 13 April, 2015.